Belt drive for silent, smooth, and joint-gentle concentric run! Very precisely adjustable and almost wear-free brake system! 172.5mm CrMo cranks made of special steel with lifetime warranty against breakage! Very loadable, because the spread power transmission from the foot pedal by four-point-fastening of foot pedal - technology of the pro cycling! The Life Fitness Indoor Bike IC2 Powered By ICG was developped for the professional, commercial indoor cycling use. The Life Fitness Indoor Bike IC2 Powered By ICG is ideal for users at home, who want to refer to the wealth of experience of an established commercial equipment manufacturer. 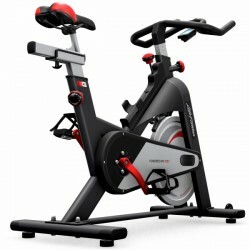 Life Fitness Indoor Bike IC2 Powered By ICG ajouter sur la liste de comparaison.